This site celebrates the first European voyage of discovery along the west coast of the United States. Juan Rodriguez Cabrillo sailed along these waters in 1542, a scant 50 years after Columbus' first voyage to the New World. The Old Point Loma Lighthouse is included in the Monument. It's a short 200-yard hike from the visitors center, and provides more views of the harbor. It's highly recommended as well. There is a statue of Cabrillo, donated by his native Portugal, that faces the explorer's landing point at Ballast Point. The statue is no great shakes, but from its vantage point one can often see into Mexico. A classic lighthouse, the Old Point Loma Lighthouse, is one main attraction. Visitors are allowed up into the small stairway to see how the custodians lived. However, when we went in 2002 we weren't actually allowed into the rooms; we had to make do peering past open but cordoned-off doorways. The second main attraction is the view. 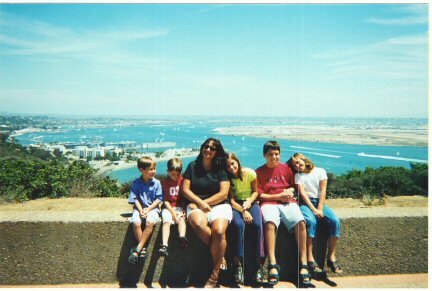 San Diego harbor is spread before you in from the visitors center overlook, and what a view it is! Watch planes fly in to the San Diego Airport, see the military base, thrill to ships coming in and leaving the beautiful harbor. There are also trails down to the shore, protected tidepools, stuff like that if you're interested. Kids will enjoy this. The lighthouse obviously is tops for them; we had a short wait to enjoy our walk inside. But the spacious visitors center is nothing to sneeze at. There are ample exhibits on 16th century clothing, armor, and weapons. There is a full suit of armor that entranced our younger boys. This allowed the parents to learn a little of the history of Juan Rodriguez Cabrillo and why he was so important. The view of the harbor is fantastic; I'd recommend it even if there wasn't a stamp involved! I couldn't get enough of the planes flying into Lindberg field. I'm a sucker for flight patterns. (One night, a view of San Francisco International Airport had me rhapsodising about strings of pearls in an indigo sky. You're lucky that's a forgotton chapter of my history) The military airfield is impressive as well, and we enjoyed watching the ships steaming about. Just south of Mission Bay and Sea World, I-5 intersects with I-8. Get on I-5 going south. Take the first exit south of I-8, which is Rosecrans Street. Follow Rosecrans about 1.5 miles, and turn right on Chatsworth Boulevard. Follow Chatsworth as it winds around and becomes Catalina Boulevard, and take it all the way south through scenic Point Loma until the road enters a U.S. Naval Reservation. Do not fear, continue on until it ends at the Monument. The drive is half the fun! 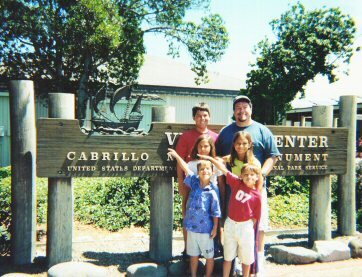 Cabrillo, being on the coastline, is remarkably close to California Coastal National Monument.